CHESTER, Nova Scotia, December 13, 2012 – GN Thermoforming Equipment has introduced a new high-speed robotic stacker for its contact-heat, in-mold cut thermoformers. GN’s RSX robotic stacker delivers greater stacking flexibility and faster cycles for its GN 3625DX, 3021DX, and 4532D thermoformers for the production of plastic packaging. The new high-speed robotic stacker was developed in response to customer demand and was designed with their considerable input, according to Jerome Romkey, GN marketing manager. “The RSX robotic stacker provides superior performance at a competitive price,” said Romkey. The new unit stacks at a faster rate than the previous model and provides A/B and A/B/C stacking capabilities. 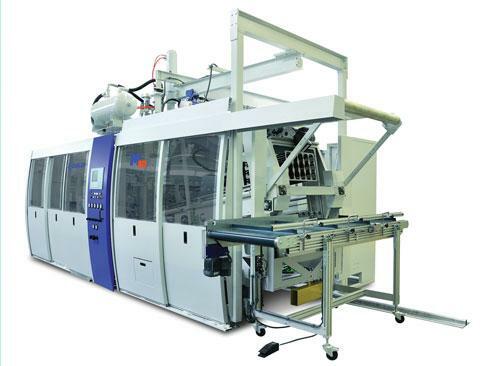 The rotating head turns products 180 degrees for de-nesting and can stack any configuration that the thermoformer delivers, the company said. Another important feature is that the x/y axis is positioned in the center of the sheet line unlike the previous system which had it positioned to the right. This results in more robust handling and transfer of parts at high speeds. The RSX robotic stacker is commercially available and the first unit was shipped in November. GN’s DX series thermoformers are servo-driven machines that provide significantly greater cutting capacity of APET sheet for food packaging applications. The GN3021DX (30 x 21 in. forming area) and GN3625DX (36 x 25 in forming area) models boast a more robust design with increased production capability.